It was in December 2006 that I first realised that I should have listened in Maths class rather than daydreamed. I was trying to get my head around the difference between straight and diagonal grids in Lace 2000. Why? you may ask. I had printed out a pricking in 1/10 straight instead of 1/10 diagonal and was trying to understand why there was such a difference in the pricking size. I had the book Threads for Lace Edition 3 by Brenda Paternoster (her website is here and the latest version is Edition 6 in 2016) and I was trying to use it to work out what threads that I had, would work with what patterns I had or could make on Lace 2000. Arachne members offered advice as did my fellow Australian Gumnut but being mathematically challenged I was having trouble understanding the difference between diagonal and straight in regards lace. A light bulb went nova while MSN chatting to Jenny Rees, (who had been the tutor at the Darwin Lace workshop I attended last year). Thank you Jenny! The lace makers who have started designing without computers had to use what graph paper was available and to get a wider range of sizes they used the graph paper in the two ways described below. Lace2000 mearly follows their example. As I has skipped straight to Lace2000 without first using and understanding graph paper designing I lacked the understanding. The same size graph gives two different size prickings - dependent on the angle that the pricking is done at. Now that I finally got my head around that, it was a simple case of measuring to see the distances between dot A and dot B in the Torchon footside. 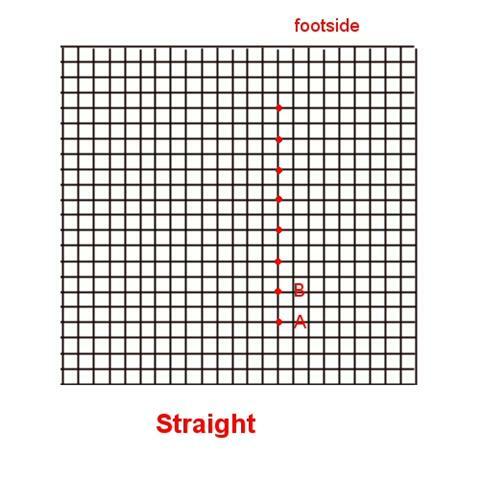 I however chose to measure over a distance of 11 dots and divided by 10 to give me a more precise measurement. Below is what I came up with. I also found out that 4mm = 0.15748 inches and 3mm = 0.11811 inches. This can be cross referenced with the Threads wraps per space table on page 8 in Brenda Paternoster's book to find the right size thread for the grid, then a quick search in her book gives you alternative threads to use. NB: As I am working in Torchon it is the 12 column that this relates to to me. At last it is starting to make sense! I hope this makes sense to you as I doubt that I will EVER do this again. Revisited the Grids page as I had realised that I might not be alone in trying to work out what thread would work with a particular pricking I had, especially when the pricking did not have a grid size or thread recommendation with it. 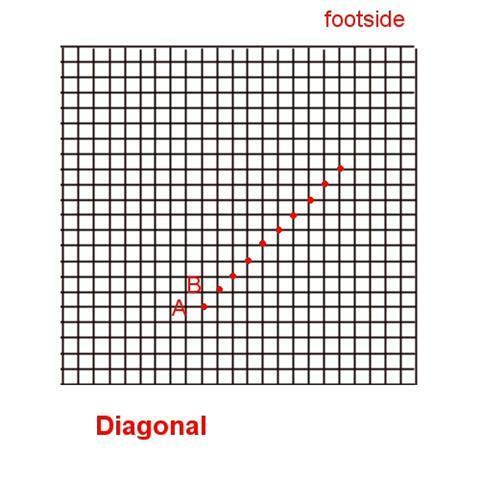 I measured along 11 footside pinholes, divided the answer by 10 to give the distance between 2 footside pins. I wrote the Torchon Lace Assistance chart where I could look up what size graph it was and what thread size (wraps per centremetre) was recommended for it. There is also a PDF file put together called WPC to Grid Chart that makes it easier for me to know what size grid will work with a particular WPC thread.